The year is 1888. The place is Melbourne, Australia, not the Melbourne we know today but an alternate one in an alternate universe. In this world the industrial revolution occurred 150 years earlier than in ours; early efforts at developing electricity were thwarted so that there is no electricity; and machines are powered by steam. Technical advances have been made – mechanical computers, super-spring technology and flight. On the other hand, this world is not socially or culturally advanced. Poverty and danger abound; the environment is polluted; ruthless captains of industry flout the law; and children are neglected and exploited. The Industrial Revolution started in the early 1600s, 150 years before it did in our world. It started in Italy where Giovanni Baptista della Porta from Naples first invented the steam pressure cooker, was heavily influenced by Leonardo da Vinci’s inventions and was funded by the de Medicis, which led to an earlier, more diverse, steam-powered revolution. Thus by the 1880s steam was powering not only industrial machines, but also a variety of other machines, notably flying contraptions and calculating engines. Accompanying this was a more Italian influence on design, particularly in the transport and fashion areas. Thus the world of the Della Mortika Sisters resulted from a divergence that happened because of intelligence (Della Porta), invention (Da Vinci) and philanthropy (de Medici) all set off with a touch of Italian design. A tragedy occurred at the Paris World Fair in 1867. All the pioneers in electricity were there, including Swan, Tesla and Edison, attending a demonstration of Edison’s electric light when it exploded, blowing up the entire pavilion, killing all the participants. This set back the invention of electricity for decades. No-one claimed responsibility for causing this tragic occurrence but at the time there were reports of a tall, thin, shadowy figure slinking from the scene. Clockwork mechanics has been refined and expanded to produce amazing mechanical contraptions, from tiny watches to large wind-up vehicular items. Spring technology has progressed to great heights, with huge amounts of energy able to be stored therein. Mechanical and computing machines are well advanced. Charles Babbage had received extensive royal backing for his analytical machine and so was able to build and improve his technology, so that it was greatly advanced in this world. Natural sources of energy have been harnessed, such as wind and moving water which when combined with steam produce formidable forces. Design has also been influenced by industry’s Italian beginnings. Elegant is the word to describe machines and fashions of this time. Predominantly, the laws of nature and physics will be as they are in our world. However, fantastical science and the supernatural (as opposed to religious beliefs) exist. Here, there are no wizards, magic, wands or spells. There are on the other hand, alchemists, astrologers, numerologists, phrenologists, science –based ghost hunters and other fringe-dwelling scientists. Gold was discovered in Victoria in 1851 and Melbourne is a thriving city because of it. Migrants flocked to Melbourne to find gold and brought with them a treasure trove of cultural diversity and innovation. The resulting expansion of industry under steam has come at a cost to a city like Melbourne. Victoria is rich in coal deposits, so steam is produced by burning coal, which produces a dirty smoke byproduct. Melbourne is a Victorian city smothered in coal-fuelled smog. This has extended to the rural areas close to Melbourne, which look more like the Yorkshire Moors than the lush countryside we know. The city centre sits on a mile square grid of streets crisscrossed by cable cars. The main streets are broad, but the lanes behind buildings are narrow and dark. By day, the city is busy with people on foot, in stovercraft, or windup short trip cars. ​At night, the city streets are lit by gas lamps, which throw a weak circular light into the smog. Paddle steamers move up and down the Yarra River day and night. Suburbs spread out from the City Centre in a less planned fashion. 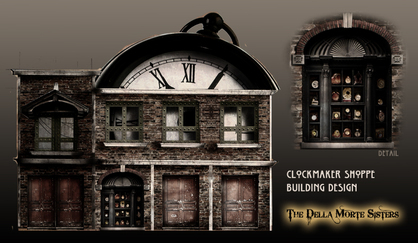 The values of the Della Mortika World are similar to those of our Victorian society. Human life, family and freedom are valued, as are respect for property, honesty in dealings and the value of hard work. Position, status and wealth are respected. Over and above these however, are valued the traits of intelligence, creativity and innovation. Wealth is measured in patents, trademarks and copyrights. Theft of IP is punishable by death; whereas petty theft is punishable by a day in the Carousel of Shame, a Della Mortika version of the stocks. To be labeled a dunce is to suffer a humiliating ostracism. To be named as a Luddite is social death (as well as time in the C of S). To present yourself elegantly is expected; beauty is not mandatory for social acceptance. Respect for others is required in the form of good manners. Bad manners will see the perpetrator in the C of S.
Education is prized in the Della Mortika World. Not going to school brings a half day in the C of S. Schools are provided by the colonial government. Animals are respected in this society. They are not used as beasts of burden. People do not eat animals. People keep robotic animals and birds on perches, not real animals. They do keep pets however, such as cats and dogs. They do not ride horses. There are no abattoirs, no tanneries, no fishing. Farming is restricted to market gardens and fibres used to produce cloth. The textile industry has evolved to produce fabrics which closely resemble leather and are more durable than leather, obviating the need for real leather. Furs are banned. Cruelty to animals is punishable by dunking in the river Yarra followed by a protracted period in the C of S. These people are particularly targeted by the animal-loving public who pummel them with rotten tomatoes and apples supplied for the purpose at the markets in which the Carousel is usually situated. Della Mortika society is basically a Victorian style society. There is class structure based on wealth. The hierarchy reflects the values of the society (refer below). Monarchy (V & A are great inventors; the V&A Museum is actually the most famous Inventorium in the world). Others (There is certainly an underclass here, who live in poverty). People with servants are considered to have failed – you don’t have a machine for that? – is the question they are asked. Famous people, in particular female inventors of the time, are often seen visiting Melbourne, as travel is speedier than in pre-steam days and Melbourne has a reputation for being a centre of innovation excellence. Post was the preferred form of communication, with steam power speeding the process greatly. The British Empire is at its peak. Victoria is a colony of Britain, as is NSW. Victoria was granted responsible government by the Imperial Parliament by the passage of the Colony of Victoria Act 1855. Thus was established the Victorian Parliament. The government taxes its citizens and funds schools, hospitals, the public service including the police and the army, universities and the Inventorium. Private funds raised through sale and export of inventions pay for infrastructure costs and improvements to transport and communications. The 1888 Antipodean World Exhibition is about to take place in the Exhibition Gardens and Buildings in Melbourne. The BVB Steam Power Company has just announced record profits. Victoria is at war with NSW over resources. The disputed area is that around the NE border of Victoria, an area thought to be rich in gold and coal. War is a battle of engineering inventiveness and is very properly conducted. It is a source of innovation in weaponry and is tolerated by the society for this reason.